We eat salmon at least once a week, because of all the proteins we could pick, this is the seven minute dinner that can be made in a number of ways. I’ve shown you many salmon recipes in the past, including my most recent salmon with pasta, cauliflower and olives. When I was asked to partner with the National Salmon Council, I wanted to show you the easiest, most reliable way to get the best-tasting salmon in less than 10 minutes. 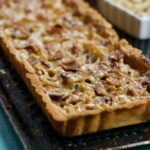 I wanted to create a fun, family-friendly recipe to be fun, that brought out the best of salmon, while being a little unique. I imagined vibrant colors of the rainbow and salmon tacos with tomato mango salsa popped into my head, and then onto this tray. 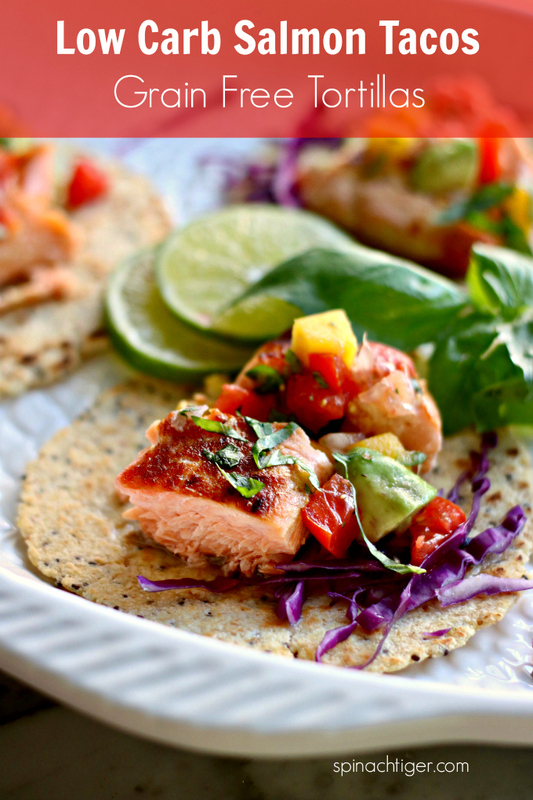 Salmon tacos are easy and adaptable to your own taste. For example, I leave out anything spicy when I’m serving kids, but they tend to love the tomato mango salsa. 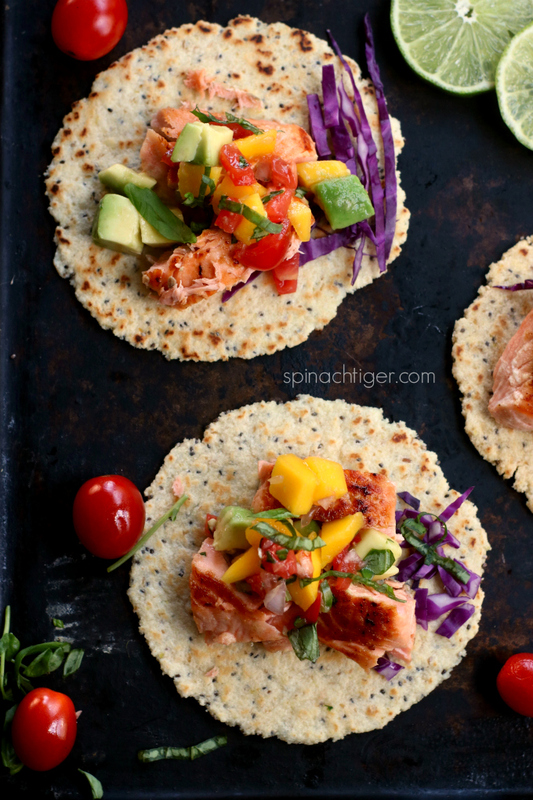 Salmon tacos are slow food fast, made in a matter of minutes and still so good for you. The salsa can be made in advance, and all you’ll need is seven minutes to pan-sear perfect salmon (I promise). I like to pan-sear the salmon on one side (skin side down) for two minutes in a hot pan and then put in the oven for five minutes. This is my basic salmon recipe from which many recipes can be created. The biggest thing I hear from people is their apprehension to cook salmon or to cook fish indoors. Let me put all this to rest and tell you, once you cook salmon properly, meaning not overcooking, you’ll be making it every week and it’s not that fish that makes a house fishy. Mangoes love tomatoes and avocado. Be prepared to swoon over this combination and probably eat it out of the bowl (like we did). Red onion and cilantro bring these three ingredients together in perfect harmony that brings just the right amount of excitement to fish tacos. Sometimes, instead of cilantro, I use fresh basil for the salsa. 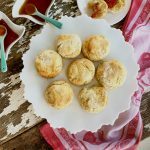 Always make recipes your own! Make sure your mangoes and avocados are ripe, but not too ripe. I buy my mangoes when they have a slight give, but not too much. Conversely, I buy my avocados rock hard, then ripen them myself. I explain why in this post, how to ripen avocados. 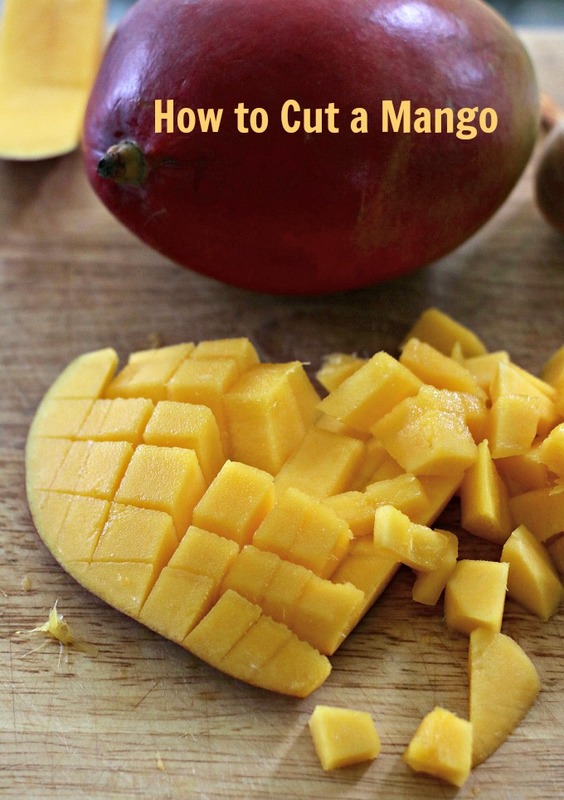 Cut the mango, by first holding it vertically and cutting the cheeks of the mango, avoiding the inner seed. Then cut crosswise and lengthwise, not cutting through to the skin. Then slide the knife close to the skin under the cubes. When cutting the tomato, squeeze off a little of the juice and seeds. 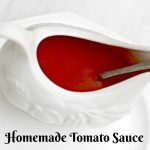 If you use Roma tomatoes, you won’t have an issue. Cut a very small dice. Avocados are a superfood and healthy fat that do well with a bit of acid and salt, and when paired with a sweet fruit like a mango, it’s incredible. I peel my avocados first and then cut into a dice. Red onion, plenty of cilantro, a touch of syrupy balsamic, and sea salt bring it all together. Shredded purple cabbage adds a little crunch, and a little color. I suggest flour tortillas or my easy made from scratch grain free low carb tortillas (shown in the picture). Salmon is a superfood that we should eat at least once a week. Rich in Omega-3 Fatty Acids, EPA and DHA, salmon is loaded with selenium, potassium and is anti-inflammatory. Mangoes promote eye health, facilitate digestion and aid in lowering cholesterol and have a low glycemic count, not spiking blood sugar. 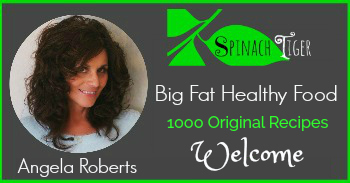 Avocados are known universally for their “good fat” and red cabbage has amazing antioxidant properties. Salmon is usually a signature dish we serve to company. 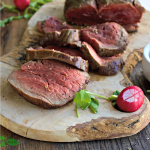 We always get rave reviews, whether we pan-sear or cook on the grill with this technique. In all honesty, I jumped at the opportunity to partner with the Salmon Council, because there is never a time salmon is not in our freezer. It’s my go to for a post-workout lunch and part of my overall low-carb lifestyle. 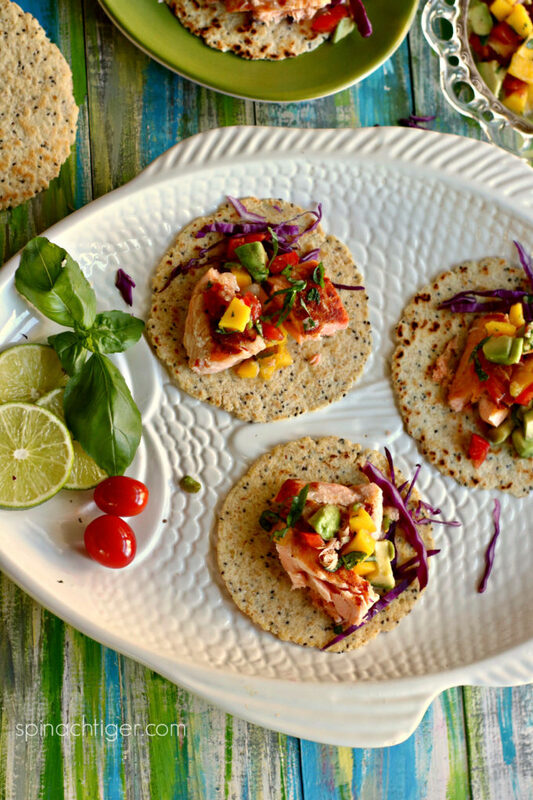 Follow the Hooked on Salmon Pinterest Board on Pinterest. Follow Hooked on Salmon on Facebook. 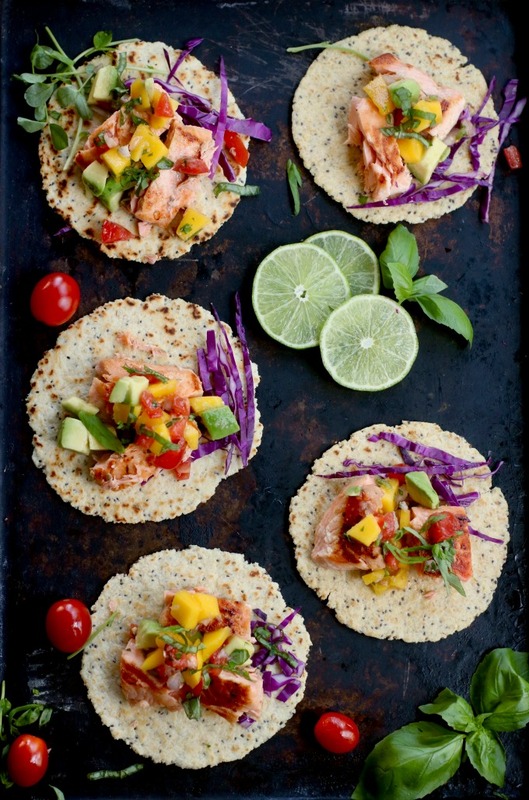 Pan Seared Salmon Tacos with Mango Tomato Salsa Recipe, a rainbow of superfood comes together to make exciting tacos the whole family will love. Heat oven to 350 degrees f, 180 C, Gas 4. Marinate salmon with olive oil and lime juice, while oven is preheating. Season with a little bit of salt and pepper. Heat olive oil in pan to medium high in oven proof pan. Place salmon in pan skin side down. Cook for two minutes or until skin is crispy. Place pan in oven for about 5 minutes. Keep in mind that the salmon will continue to cook once removed from the oven. You do not want to overcook the salmon. Remove the skin, cut into pieces to place in tacos. 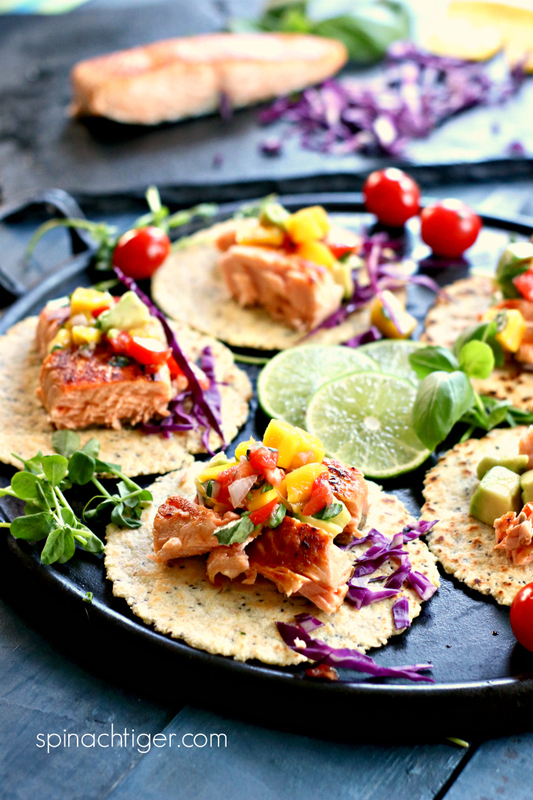 Assemble with salmon, red cabbage and mango tomato salsa. Serve Immediately. Cut mango into cubes. Hold up vertically, slice off each cheek. Slice across, not cutting skin and then slide knife under cubed mango. Cut tomatoes into very small dice. You may need to squeeze juice out. Peel avocado, and cut into cubes. Toss tomatoes, mango, cilantro and red onion together with lime, ¼ teaspoon salt syrupy. balsamic or white vinegar and honey. Only use balsamic if you have a good syrupy sweet balsamic. 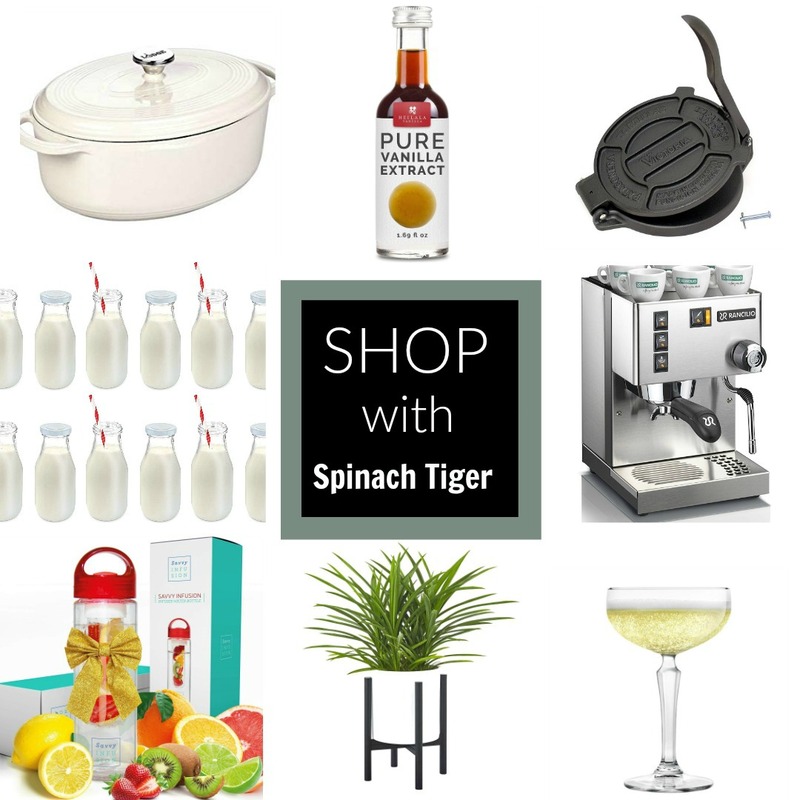 In lieu of balsamic, use 1 tablespoon white vinegar with 1 teaspoon honey. I love the look of these tacos. They are bright, fresh and colourful. They sound really simple and quick to put together too, which is a big bonus for me. 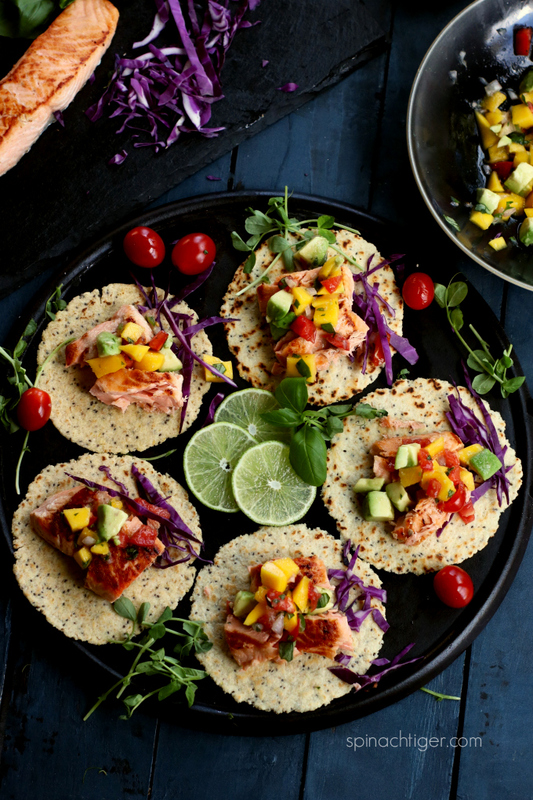 These tacos sound wholesome & utterly delicious and the mango gives a lovely burst of colour. What a wonderful colourful meal – this really takes eating the rainbow to the next level! Yay. We love this so much. It works! You have to just be careful not to overcook. Happy Cooking. I’m loving the tomato and mango salsa that you have added to these seared salmon tacos, really is such a lovely flavour combination. Thank you so much. 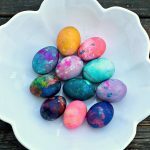 This is a fun recipe. 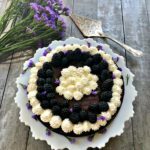 All I’ve come across today from the blogs I follow, and I follow a lot of them, are chocolate cakes! First of all I don’t bake, secondly you can’t get nourishment from cakes, and thirdly, I don’t have a sweet tooth. I’d rather eat THESE!!! And so lovely. I actually bake a lot, but usually it’s low carb. I’m glad you like these.